A well presented end of terrace house located centrally in the town and within walking distance of nearby amenities including the Post Office and Sainsburys Supermarket. The accommodation provides 2 double bedrooms with bedroom 1 providing enough space for a 'king size bed', with built-in wardrobe cupboards in both bedrooms. 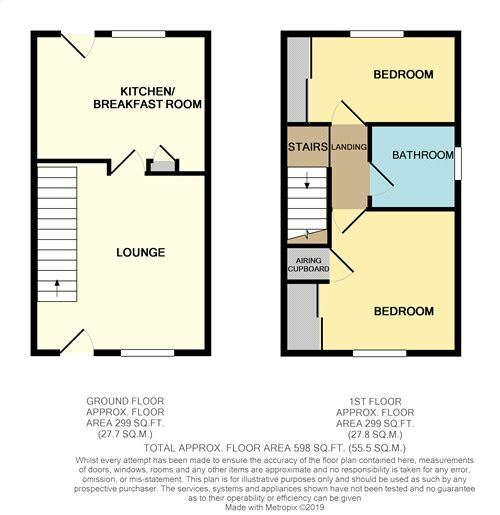 On the ground floor is the lounge and fitted kitchen/breakfast room with room for a table and chairs. Outside there is car parking on the brick-weave driveway in front of the property, the rear garden measures approx. 35ft and is mainly laid to lawn. From Sainsbury's, turn left into Hargham Road, keeping left fork left into Leys Lane, then left into Thorpe Drive follow this road turning left into square where the property will be found at the end on the left hand side. 14' 1" - 13' 3" x 12' 10" (4.29m - 4.04m x 3.91m) Double glazed front entrance door, stairs to first floor, under-stair space, radiator, wall mounted meter cupboard. 12' 10" x 9' 11" (3.91m x 3.02m) Fitted in range of matching base units and wall cupboards with fitted work tops comprising sink unit, space for cooker with extractor hood above, plumbing and space for automatic washing machine and slimline dishwasher, space for fridge freezer, space and vent for tumble drier, built-in broom cupboard, radiator, double glazed door to the rear garden. 10' 1" x 9' 5" (3.07m x 2.87m) Built-in mirror fronted double wardrobe cupboards with sliding doors, built-in airing cupboard housing wall mounted gas combi boiler, T.V point, radiator. 10' 8" x 6' 9" (3.25m x 2.06m) Built-in mirror fronted double wardrobe cupboards with sliding doors, T.V point, radiator. Comprising w.c., bath with independent shower over with shower rail and curtain, wash hand basin, extractor fan, radiator. The front of the property is open plan and shingled with a paved pathway to the front door and 2 tandem car parking spaces. A side gate leads to the side garden which is shingled and leads to the rear garden. The rear garden is enclosed by fencing and is laid to lawn with a paved patio area, outside tap and garden shed.